On April 26th 2017, Microsoft released Feature Pack 1 (FP1) for BizTalk Server 2016 and it’s been a while since I was this excited for a BizTalk Server release. Yeah, I just said that. I’m more excited for this feature pack than I was for BizTalk Server 2016 or even 2013 and 2013 R2, and here’s why… this is the first ever Feature Pack for any release of BizTalk Server, and is setting a precedent that we have never seen before in the 16+ years of the product. So, what is a feature pack? A feature pack is a release of new non-breaking features for the product. These are not bug fixes or anything like that (those are distributed quarterly through Cumulative Updates). These are brand-new features that extend the product in new ways and help customers get the most out of their BizTalk Server investment. My takeaway is that the team’s goal is to offer real answers to problems that customers face in the timeliest manner possible. I’m excited that the BizTalk Engineering team at Microsoft will be releasing new features on a more regular cadence. It’s awesome that they are building new features to address long-overlooked issues and not making us wait another 2 years to get our hands on them. FP1 is available to customers with Software Assurance who are using the Developer or Enterprise editions of BizTalk Server 2016. FP1 introduces some innovative new features to BizTalk Server and addresses some longstanding concerns that many customers have had. The new features break down into three categories. Anyone who’s worked with BizTalk Server knows that the deployment/ALM story has left something to be desired. For years, the “official” deployment story has been to deploy applications using BizTalk MSI Packages. Although the BizTalk MSIs are pretty easy to use and they work well for simple applications, they tend to be inflexible and break with the complexities of a real application in the real world. For example, to create a BizTalk MSI Package I have to deploy all my assets to the BizTalk Server Management database and then I can generate an MSI with those assets. It sounds easy and it is. The issue is that if I introduce a new assembly, or port, or anything at all, I have to add that new resource to the BizTalkMgmtDb and then generate a new MSI. In the modern world of DevOps and continuous integration/deployment, the standard MSI-based deployment is pretty cumbersome and most teams wanting to adopt those types of strategies need a different answer. In the past, those teams have used community-designed tools such as the BizTalk Deployment Framework to automate building an MSI from source code repositories (like most modern ALM solutions) and therefore eliminating the need to deploy to a BizTalk Server system to create the deployment package. Feature Pack 1 for BizTalk Server 2016 introduces two new features that will serve as a foundation for more sophisticated deployment strategies in the future (which my inside sources at Microsoft have confirmed are coming in later feature packs). Deploy with VSTS – Enable Continuous Integration to automatically deploy and update applications using Visual Studio Team Services (VSTS). For anyone who has used the build/release features of TFS or VSTS, this will be immediately familiar. This is a deployment task that you add to your release pipelines to deploy new or redeploy/update existing BizTalk Server applications. If you haven’t used the build/release features of TFS or VSTS check out this post where I explain how to use those features to enable continuous release for a Logic App. New management APIs – Manage your environment remotely using the new REST APIs with full Swagger support. Imagine having RESTful web APIs for updating, adding, or querying the status of your BizTalk Server applications and their resources… now stop imagining it because it’s a real thing! 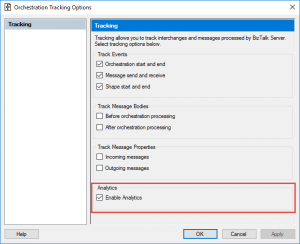 The tracking capabilities in BizTalk Server are extensive, but the configuration is often unintuitive, and no one likes digging through the BizTalkDTADb for the instance data they need. FP1 enables you to send your tracking data to Azure Application Insights and feed operational data (subscriptions, batching status, message instance counts, etc.) to Power BI. Application Insights – Tap into the power of Azure for tracking valuable application performance, usage, diagnostics, and availability. 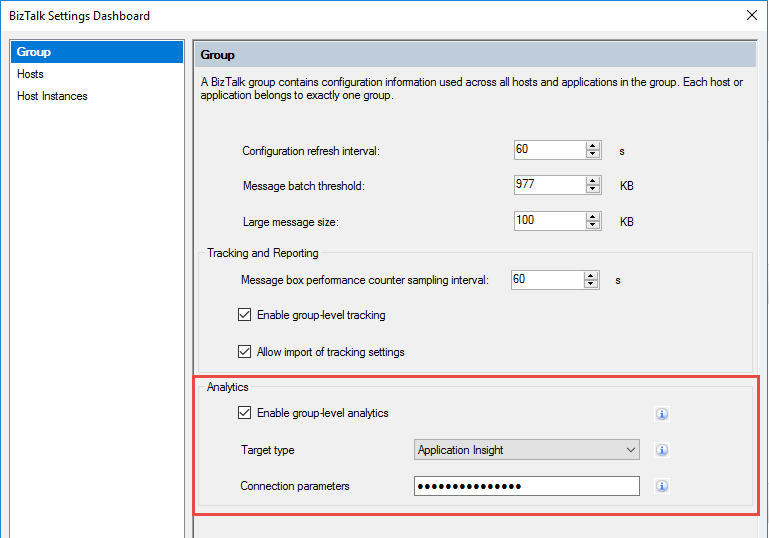 Enabling this is super easy: after creating an Application Insights instance, in the BizTalk Settings Dashboard there’s a new section for enabling analytics. 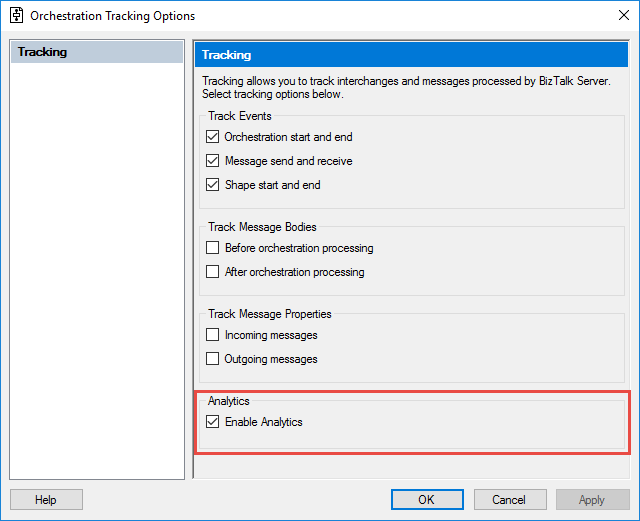 Once you’ve enabled analytics and provided your App Insights instrumentation key, in your ports and orchestrations you will have a new setting to output the tracking data to App Insights. Leverage operational data – View operational data from anywhere and with any device using Power BI. This operational data is the same kind of information that you’d typically view using the BizTalk Group Hub (suspended instances, subscriptions, tracked events, etc.). If you can build a query for it using the Group Hub, you can output that to Power BI… but why would you? Because Power BI gives you the ability to view that data from anywhere (without having direct access to the BizTalk Group), and the tools in Power BI make querying that data surprisingly easy. With Power BI, you can ask questions in plain English and have MDX-style queries created for you in the background. FP1 comes with a pre-built Power BI template, but you of course have the ability to build your own. I’m interested to see what the BizTalk community can create using these tools. If I’m being completely honest, the two features in this runtime category weren’t really on my radar at all until Tord Glad Nordahl stopped by one of my classes last month and discussed them with the students. But now that I’ve seen them, I’m excited for the potential and happy that customers with these requirements are getting some much needed love. 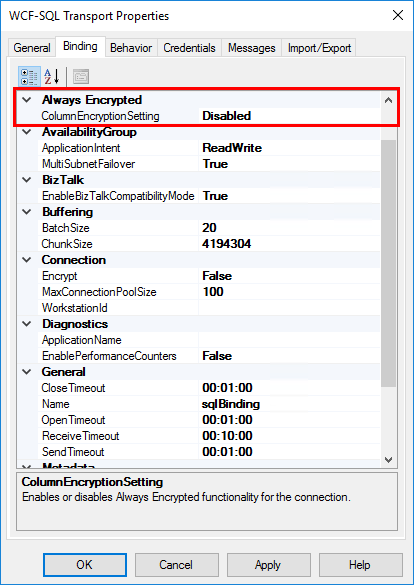 Support for Always Encrypted – Use the WCF-SQL adapter to connect to SQL Server secure Always Encrypted columns. Basically, SQL Server 2016 introduced a feature that enables client applications to read/write encrypted data within a SQL table without actually providing the encryption keys to SQL Server. This gives a new level of data security since the owners of the secure data (i.e., the client applications) can see it, but the manager of the data (i.e., SQL Server) cannot. This ensures that on-premises or cloud database administrators or other high-privileged (but unauthorized) users cannot access the sensitive data. 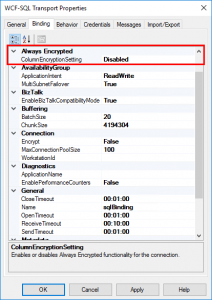 With Feature Pack 1 of BizTalk Server 2016, the WCF-SQL adapter now offers an Always Encrypted property where you can simply enable or disable the feature as your needs dictate. Advanced Scheduling – Set up advanced schedules for BizTalk receive locations. 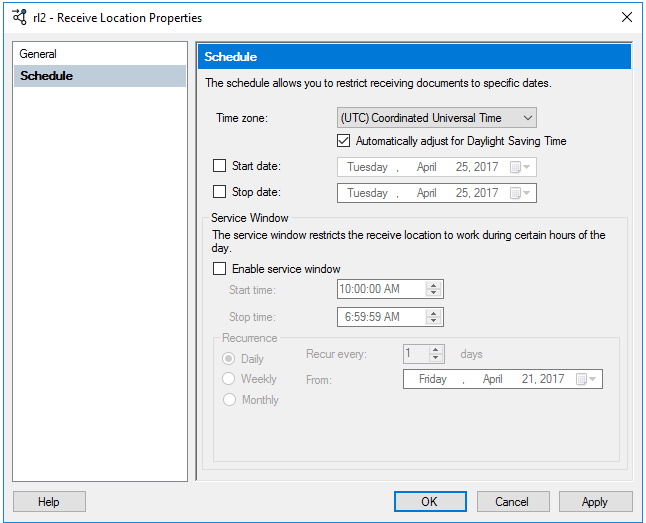 The Schedule page of receive locations has additional options for shifting time zones and setting up recurrence schedules. As always, the QuickLearn Training team is already looking for the best ways to incorporate these new features into our courses, but until we do you should grab the Feature Pack for yourself and give these new features a spin for yourself. While you’re at it go to the BizTalk Server User Voice page and vote for the features that you’d like to see in the next feature pack, or if you have an original idea for a feature add it there and see how much love it gets. The information you provided in this article is very useful. As a newbie, i learned a lot about BuizTalk from your blog. The information is worth and very useful for the beginners.Thank you very much. A beginner can refer to this online resource as which I found as a helpful guide.